Get your guitar’s intonation checked before the session (by a pro) and borrow the best guitar you can as a back up. Sessions will grind to a halt if not. Poor instrument tuning or intonation will turn your Master Recording into a DEMO. 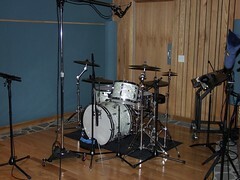 Incredible performance and feel can turn your DEMO into a Master Recording. A relative, usually Mama, finances most studios these days. Monitoring is everything. Make sure your monitoring system costs more than your DAW. Church musicians are never as good as they proclaim. Be nice to everybody because you’ll see the same folks on your way up and on your way down. Avoid stereotypes: not every African American can play drums or has rhythm. Expensive instruments do make a difference. People who post a lot on forums read magazines more than they work. In music, timing is the whole ball of wax. People who have great rote memory skills can be incredibly stupid. Work out your publishing arrangements (as a band) before you come into the studio. Don’t believe anyone at Guitar Center. Look at an old sailor before you get that tattoo. Every children’s song sounds like The Ballad of Davy Crockett. The low end is the hardest thing to get right. If you can’t stand plastic-tipped drumsticks why do you like plastic beaters? Credits cost you nothing. Give them away liberally. Put two recording engineers in a room and you’ll have three opinions. When recording there are no rules, only principles. There’s no competition in pure art. The need for a domineering producer is directly proportional to your lack of talent. Engineers who have ‘tone’ in their description (such as ‘The Tone King” or Tone Miester”, etc. etc.) usually don’t get it (tone). You save money and time when you hire studio musicians. This entry was posted on Sunday, December 21st, 2008 at 5:01 pm	and is filed under Uncategorized. You can follow any responses to this entry through the RSS 2.0 feed. Responses are currently closed, but you can trackback from your own site.